Years ago a local mountain retreat center failed their annual water inspection. Their drinking water came from a nearby spring. Because the retreat provided services to the public, the health department required an annual water test. For years, this test seemed a formality. The mountain water was cold, fresh, and always delicious. Then the water failed to pass. A little exploration uncovered the problem. Near where the spring surfaced lay the decomposing body of a deer. Horrifying, right? Of course, urgent steps were taken. The carcass was removed, but that was just the beginning. Far more important were the steps taken to prevent anything like this ever happening again. The spring source was covered and fenced. An expensive filtering system installed. After a little work, the water passed inspection again. See, when you depend on a spring for your water, it is vital that you protect it. The ancient book of Proverbs gives us this wise counsel: “Guard your heart above all else, for it is the source of life.” (Prob. 4:23) Of course, this isn’t talking about your literal blood pump. It’s talking about a part of you that lies at the center of who you are, something I’ve started calling your inner life. I’ve been using this phrase quite a bit lately. I’m convinced that this part of us is the single most crucial aspect of our lives. But then I realized, I probably ought to get clear about what I mean. I don’t want to be throwing around a vague term that doesn’t mean anything. So, what is our Inner Life and why does it matter? Start by thinking about your life. When people ask you how life’s going, what do you tell them? Don’t we usually share our circumstances? Family, home, work. We might include some of the challenges we’re facing, or maybe some of the good that’s come our way. Your inner life is your deepest inward experience of being a person. It encompasses your story and sense of identity. It is where you connect with God. And this deepest part of you finds expression in your private thoughts, your emotional responses, and your intuition. 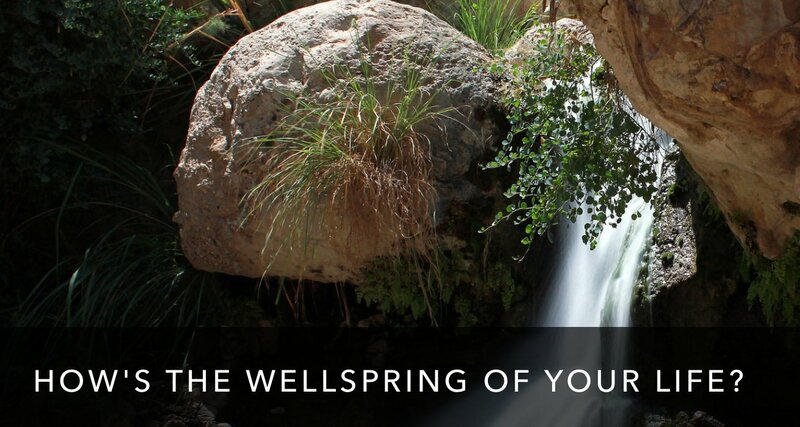 This is the wellspring of your life. Scripture calls this the innermost parts, the inner person, or the secret heart. (2 Cor 4:16. Psalms 51:6) This part of our experience matters most, because it shapes everything else. Like a spring, everything flows from here. The state of our inner life shapes how we see and relate to God. It shapes our we see ourselves and others. It is where the roots of our attachments, drives, and dysfunctions lie. It is where we hold tightly to the vows and commitments that we carry. Jesus taught that everything we do, whether good or evil, flows from this inward place. Our inner life is also the place where we experience God’s presence. It is the sanctuary at the heart of our being where the Spirit of Christ dwells, where we remain or abide. Jesus taught that the inner nature of the tree determines the fruit, but he wasn’t talking about horticulture. The fruit that we bear in the world–our attitude, actions, and interactions–will always reflect the nature of our inner life. Do you see why it is crucial, above all else, to guard and nurture your inner life? So, yea. You have an inner life. It is already shaping your experience of the world and the fruit that you bear. 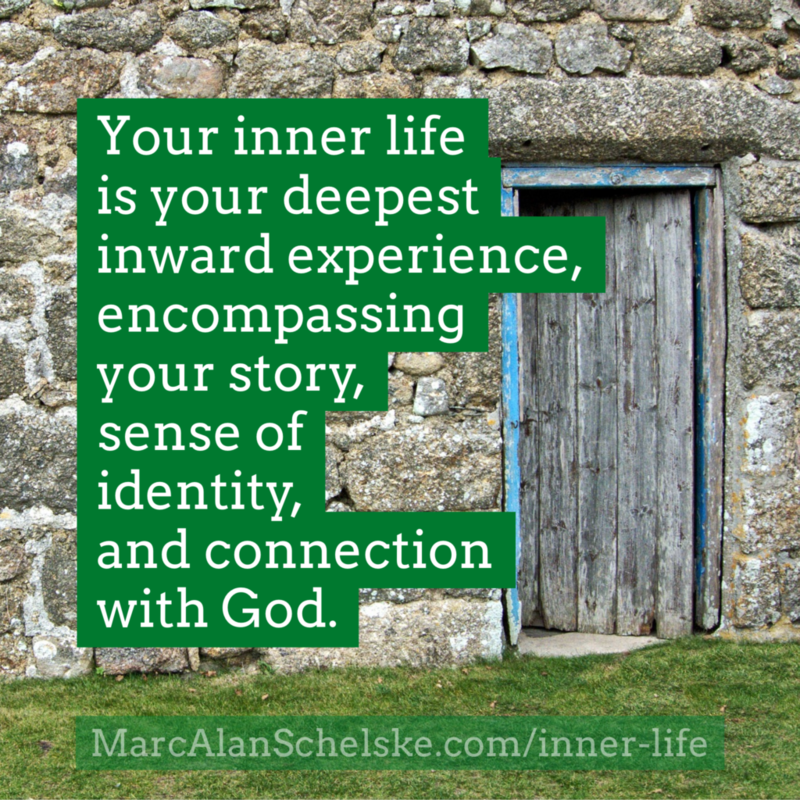 Your inner life is your deepest inward experience, encompasses your story, sense of identity, and connection with God. It finds expression in your private thoughts, your emotional responses, and your intuition. From this flows every other part of your life and experience. If you want your life to be different, this is where to turn your attention.